A BBC investigation has found that companies in Saudi Arabia are offering to artificially boost the popularity of hashtags to make them trend on Twitter - in contravention of the social media network's rules. The price to get automated "bot" accounts to make a hashtag trend for a few hours is around £150 ($200). It was an odd topic for people to suddenly be talking about. In early December a phrase which roughly translates as "Grilled Lamb Delivery" was a top trending phrase on Twitter in Saudi Arabia. Nearly 17,000 tweets mentioned the phrase - most of them promoting just one restaurant, and listing its phone number. As it turned out, thousands of "people" weren't in fact talking about one establishment's meat products, as succulent, juicy or overcooked as they might have been. In fact, the "Grilled Lamb Delivery" hashtag was a clandestine advertising campaign being pushed - successfully - by a network of automated bot accounts. The lamb trend is one of many artificially manufactured hashtags which regularly hit Twitter's list of "Trending Topics" in Saudi Arabia. They're promoted by shadowy companies that make money by gaming the social network's algorithm in an attempt to make conversations seem organic and natural - when they are anything but. On the Twitter mobile phone app, the list is one of the first things you see if you touch the magnifying glass icon. There's a worldwide list of Trending Topics, but also separate local lists detailing what's going big in individual countries and cities. Users can easily change their settings and look at lists from around the world. What goes on the Trending Topics lists is governed by an algorithm that measures not only sheer popularity (i.e. the total number of tweets), but velocity - in other words, how fast certain topics are surging on the network. It's why, for instance, names associated with breaking news and popular news site headlines often crack the list very quickly. Companies can pay Twitter to appear on the list. But these "Promoted Trends" are clearly marked as advertising. That's not the case for the artificially trending hashtags BBC Trending found. Our investigation discovered that companies in Saudi Arabia are promising to make hashtags hit the Trending Topics list for relatively small sums - and in many cases they are succeeding. To boost the popularity of otherwise mundane phrases and hashtags, these companies are using networks of bots - automated accounts which are programmed to shoot out a stream of messages at a particular time. Trending approached several companies which claimed to be able to make hashtags trend. Eventually we managed to contact the company behind the "Grilled Lamb" hashtag campaign. After a series of negotiations via WhatsApp, we were charged $200 (just under £150) to get the Arabic equivalent of "Congratulations Fahima" onto Saudi Arabia's Trending Topics list. The person behind the company promised that he could get the hashtag trending throughout the Gulf country. One attempt was aborted when the company representative said that high Twitter traffic due to a celebrity wedding meant he could not make the hashtag trend on our first chosen date. He was more successful several days later. The hashtag hit the list of top trends in the Saudi city of Jeddah, reaching as high as the sixth slot on the list. The botnet used by the company pumped out more than 600 messages including the "Congratulations Fahima" hashtag. But once it hit the list of Twitter Trends, real people began to use it. Some asked who Fahima was or claimed to be her friend. "I know Fahima!" tweeted one. "She just had quadruplets!" There were definite limitations to the power of the company's botnet. The hashtag did not make it onto the general list of trends in Saudi Arabia - although other hashtags, like the "Grilled Lamb" one, did trend nationwide. And claims by the company and other similar firms that they could get hashtags trending in the UK and other Western countries appear to be highly exaggerated. But the ability to force something onto the trending list is impressive in a country where Twitter is hugely popular. According to a survey in 2014, Saudi Arabia had 2.4 million Twitter users - more than 40% of all active users of the social network in the Arab region. Trending tried to call the number associated with the WhatsApp account which handled the transaction, but the man who answered denied knowing anything about the company's business. Hashtags which appear to be advertising in disguise regularly trend in Saudi Arabia. And although the most obvious ones are commercial in nature, there is potential for political manipulation as well, according to Marc Owen Jones, a lecturer of the history of the gulf and the Arabian Peninsula at Exeter University. "I realised in the last Saudi-Qatar crisis that thousands of accounts were producing information that are either fake or propaganda," he says. "What's interesting is having lots of these accounts is that they can manipulate what's seen by many audiences in the world, so the more accounts you have picking on a certain topic the more the topic gets pushed up to trend." "Having those bots makes people believe that this is what people in the Gulf are talking about," he said. BBC Trending takes an in-depth look at social media and the trends and technologies that are shaping our world. Twitter said it was aware of the issue and that it is committed to weeding out botnets and people trying to manipulate its system. 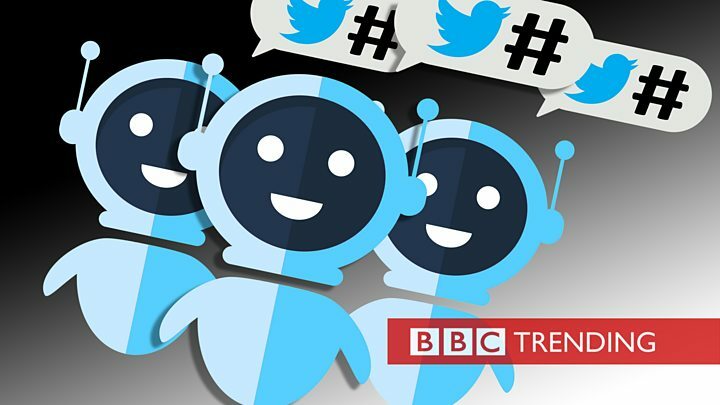 "Attempting to game trending topics is a practice as old as Trends on Twitter themselves, and over the years we've invested heavily in thwarting spam and other automated attempts to manipulate Trends," the company told the BBC in a statement. "We take active measures to protect against trend gaming, such as excluding automated Tweets and users from our calculations of a Trend. "Importantly, as spammers change their tactics we actively modify our technological tools to address such situations." Twitter said that since June 2017, it has detected an average of 130,000 accounts per day which are trying to manipulate the trends list. The company said it is taking steps to stop manipulation but declined to give details about its actions, stating that "saying more about those steps would only help bad actors."